I know that I have blogged about a few of my food cravings (yet, somehow, there are more egg posts than Cheeseburger in Paradise ones), but I really have not had those weird, pregnancy cravings that you hear women (and their ever-supportive husbands) talking about. I have pregnant friends - I won't name names - who get a craving for something and just HAVE TO HAVE IT. Right then. Right there. And, their husband better just go and get it for them. There was one time where I was kind of craving an Oreo Frosty from Wendy's, but I think I played it up to be more of a craving than it really was so I could convince David to find the nearest Wendy's and let me have it. I wanted it, I just wasn't going to flip out if I didn't get it. So, instead of food cravings, I'm having baby product cravings. And by cravings, I mean I am becoming slightly OBSESSIVE about these baby products. It all started when Dave and I decided to have our wedding photographer, Daniel, take belly shots of me....that kind of rolled into, "Oh, and we'll want newborn photographs too." Thus, began my search for examples of the two on the world wide web! For those of you brave enough, take a gander at an example of how we WON'T be posing. If you are over 18 and don't mind seeing some bare skin, click here. But, don't say I didn't warn you. 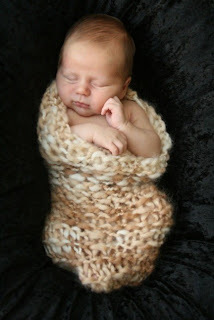 Anyway, after I found some other examples of pregnancy photos, I moved on to the really precious newborn shots from various photographers. And, that's where I found the props! As if the babies weren't adorable enough, they had to be photographed with some of the cutest things imaginable. Something is seriously wrong with you if you don't think that Peanut would be the cutest thing wrapped up in this cocoon. 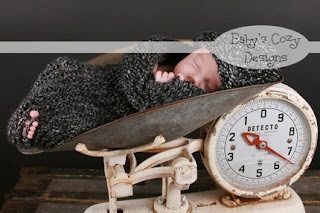 No, it wasn't the cocoon I wanted in that picture, it was the vintage scale! I have searched and scoured the internet trying to find this scale. Oh, I've seen hundreds of scales, just none of them as cute as the one in this picture. But, don't worry, I'm still searching! So, after I spent hours searching for scales and cocoons, I focused my attention onto knit caps and am pretty sure this is the one I'm going to get. Have I mentioned that I LOVE Etsy? Internet, can I get a collective, "Ahhhhhhh!!!" I know...he's cold-hearted! So, I am totally stretching it here and am begging Michele to ask her District Manager (who lives in LA and oversees an Aveda store at the mall where this Babystyle store is) to pick it up for me and transport it up to Santa Barbara the next time he comes....which just happens to be tomorrow! Even if I have to wait until he comes again next month, I think we'll be okay....as long as I know we have it. And, besides, with these cravings, as opposed to those of the Ding Dong and Frosty variety, not only am I stimulating the economy, but I'm also doing my part in keeping the scale I have to step on every two weeks from making huge jumps to the right! 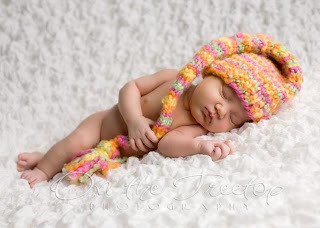 Ummmmm, that picture with the long stocking cap on the baby is quite possibly THE cutest thing I have ever seen! I feel bad that I didn't get you the "Lulu" chair (that could be a first....not getting you something you ask for that has to do with baby girl). Thanks Lauren for saving my you know what by finding Lulu for her. It is a cute chair and all but I have a feeling that baby girl will look ADORABLE no matter where she is or what she is on!! The knit cap and cocoon have been ordered! And, Mom, DO NOT FEEL BAD! You have bought SO much for your granddaughter already. And, knowing that you and Dad will be here to help after she is born is such a relief to both David and me. I love the Lulu chair! It is a must in a nursery!